The new shopping mall is located on the Zeil pedestrian precinct in the city center, one of the highest turnover shopping high streets in Germany. 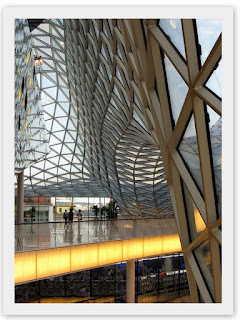 Not only this shopping mall called "My Zeil" is one of the largest in Germany, it has also attracted attention because of its unique design. It boasts a transparent glass roof that is connected to its glass façade in the form of an upward spiral. Even while it was being built, it created a visual spectacle that many people stopped to admire on Frankfurt’s main shopping street of town. We saw it under construction last summer when we stoped by in July of 2008. It is been ready and open since February of this year and it is an architecture master piece worth a visit, we add a bit of food from India for 3 euros in a small bistro in the 3rd floor... Nice!